It is said that “Breakfast is the most important meal of the day”, and Delhi has no dearth of options when it comes to sizzling breakfast options. Be it vegetarian or non-vegetarian, you would find it all in this walled-city. So one day I went around old Delhi in search of some good vegetarian dishes, and was instantly recommended Shiv Misthan Bhandar’s bedmi aloo. Shiv Mishtan Bhandar is one of the legendary shop in Chandini Chowk. Established in 1910, by Shri Mohar Singh Yadav, Shiv Mishtan Bhandar is recognized for a wide range of sweets and snacks of Rajasthani cuisine. Shiv Mishthan Bhandar is known to serve its customers with heavenly delights prepared with pure desi ghee. If you are there in the morning, you can dish on nagori halwa, a delicious dish, which consists of small puris which you stuff with halwa or relish their famous bedmi, a delicious meal of two big puris stuffed with a dal mixture, which is served with potato sabzi and chole. Flavorful methi chutney and pickles are also served alongwith. Apart from bedmi aloo, they have chholey bhature, kachori and samosa . They sell six kinds of sweets : jalebi and imarti, gulab jamun, suji halwa, mung dal halwa and malpua. 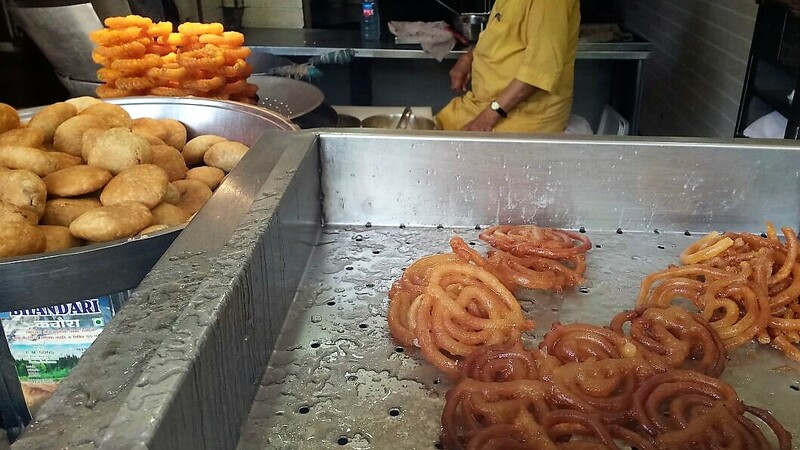 Shiv Misthan’s jalebi is juicy, yet crisp. Earlier, one had to stand and eat there, but now the place has expanded and remodeled with a decent seating space. If you are eating there, bearers keep filling your plate with sabzi at regular intervals. There are only 11 items on the menu but Shiv Misthan keeps a strict check on quality. Few of its signature dishes are must try, like Bedmi Poori served with Aloo ki Sabzi along with spicy Methi ki Chutney & Choley, Halwa Nagori with Crispy Poori, Jalebi, Imarti. When visiting Shiv Mishthan Bhandar, you are ought to leave your calorie conscious mind back home to fully enjoy the of taste and tradition of old delhi. My craving for bedmi aloo has been met, when are you going? Kulfi, a typical Indian frozen dessert which needs no occasion to be relished. Me and my friends were wandering in old delhi in search of the best kulfi and had to stop by Kuremal Mohanlal Kulfiwale in Chawri Bazar. The iconic Kulfi shop prepares delicious kulfis inside whole fruits. Is it fruit or kulfi? That’s one question that keeps everyone wondering as they indulge in this lovely concoction at this shop in Old Delhi. Kuremal Family have been serving quality Kulfi, since 1908. It was founded by Pandit Kuremal, he learned the art of making Kulfi from a Old Delhi’s Halwai at the age of 14. He started his business on the cart with two basic flavours i.e. Mango and Plain Rabri Kulfi and expanded his business gradually with time. Today their family owns two shops with name of Kuremal Mahavir Prasad Kulfi Wale, and Kuremal Mohan Prasad Kulfi Wale in the same street of Kucha Pati Ram. The outlet might be a basic one, but the preparations are mouth-watering. They have a variety of kulfis on their menu including milk based and juice based kulfis. 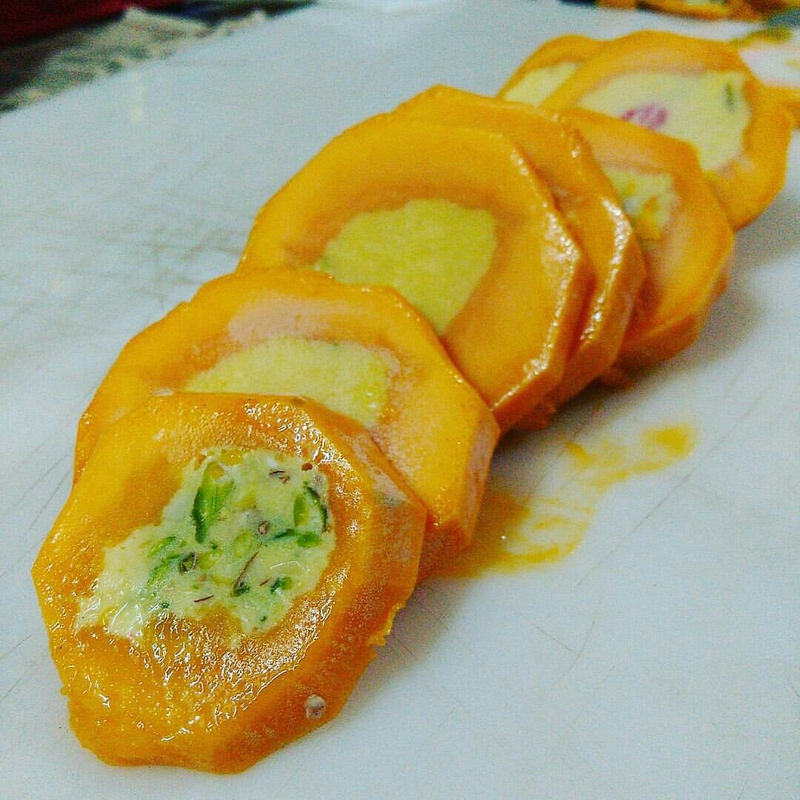 When we asked for their specialty, we were served a nicely-cut plate of stuffed-mango kulfi . Stuffed Mango Kulfi is one of their best sellers and the way of serving the kulfi is quite interesting. They use Alphonso mangoes for this delicious treat. The process is not simple as it is made by deseeding a whole mango which is then filled with Rabri and Plain kulfi. After the frozen process over, its skin is peeled away and served to the customers waiting in the queue. 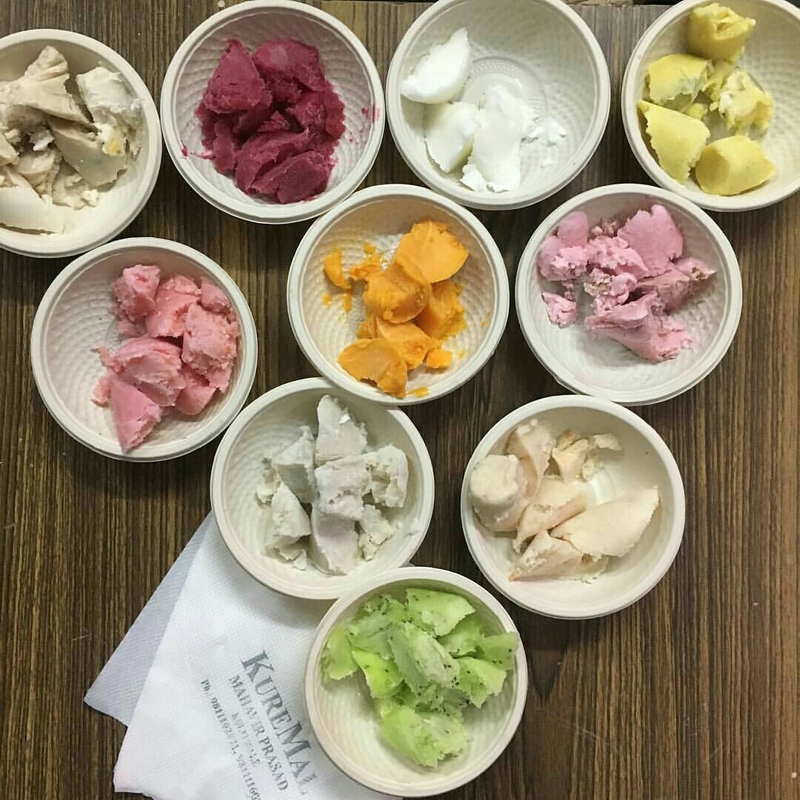 This place serves more than 30 varieties of kulfis, which are broadly divided among Rabri Kulfi cream, Kulfi Julpeps, Tila Kulfi, Stuffed Kulfi, and some other specialties. These kulfis are not just loved by Delhiites but are a nation-wide rage. The sweet delicacy is a must have in Delhi’s scorching summer. So what are you waiting for? head to this amazing shop today! We often eat butter or jam toast or fruits for breakfast. But have you ever thought combining all these things in your sandwich? Sounds like a crazy idea right! But a little coffee house nestled in the narrow lanes of Chawri Bazar did not just try the formula, but the very unique combination also became their biggest USP. Trust me guys this fruity version of sandwich is a treat to the soul. Jain Coffee house has been serving traders of Chawri Bazaar since 1948 with tea, coffee, sandwiches, shakes and the ultimate and the unique fruit sandwiches. I am sure, you cannot find such sandwiches in whole Delhi. It is a very small shop in the corner. With just 2-3 tables and 5-6 stools to sit on. 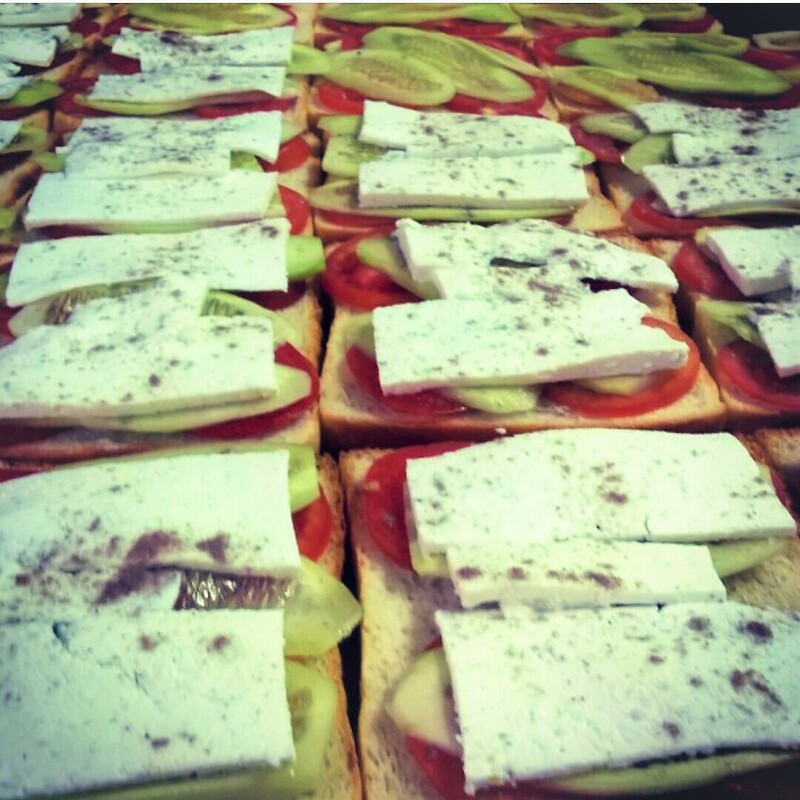 The place is run by two brothers and they usually get bulk orders for club sandwiches along with tea from the traders but their fruit sandwiches are to die for. The taste of those fresh fruits along with butter and a little jam is simply marvelous. They use fruits that are available in the season like mango for summers. 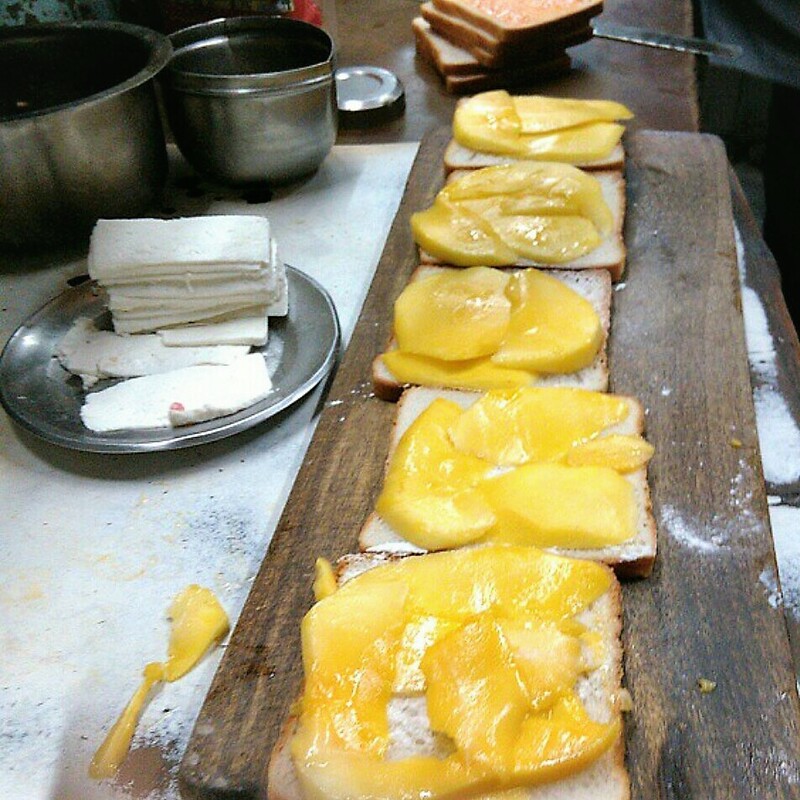 They have a wide range of fruit sandwiches from chiku, banana, pineapple to mixed fruit sandwiches. The sweet variety has two slices of bread layered with two or three fruits, of your choice, cheese slices, kesar chutney, almond butter, paneer and fruit powder,this he told me is specially ordered from Bangalore. On the other hand, the namkeen sandwich has paneer, tomato slices, coriander leaves, green chillies and salt with fruit. You can pick from pineapple, mango, banana, black and green grapes, apples and plums depending on the season. They also serve various milkshakes, Tea and coffee. Sometimes I wonder that these small joints serve better coffee than any expensive cafe. Apart from great taste, these sandwiches are pocket friendly and satisfy your taste buds and makes you go to your happy place. Want to try something new and crazy, visit Jain coffee house for a uniquely delightful experience. As a city that prides itself at its richness in the street food culture, Chandni Chowk is the place to go if you wish to taste some of the finest that the city has to offer. Located at Kinari Bazaar in Chandni Chowk, this joint tempts people from various parts of the city. Tasty chatpata chaat is one of the many tasty dishes for which dilliwalla’s are ready to forget their diet and enjoy those tangy spicy flavors guilt free. Since 1947, Padam chaat corner serves lip smacking treats like Papdi Chaat, Raj Kachori, Gol Gappe and many more. The shop is currently run by the 3rd generation of their family. Everything they sell are made at home from papri’s to even the masala sprinked over the papri’s. So one can be sure that they neither compromise with taste nor health. The famous pani puri or gol gappa has many names and different ways in which it is served in different regions. Almost every Indian is familiar with concept of gol gappa, being easily available on the streets. When you hear the word gol gappa, the only thing which comes in your mind is a crisp fried puri filled with a mixture of flavored pudina water, potato chunks and chickpeas but a mere visit to Padam Chaat Corner in Old Delhi is enough to change your mind. One of their specialty is the bharwa gol gappe. First padamji makes a mixture of Bhalla, channa, chunks of boiled potatoes and masala which is homemade and has a wonderful fragrance of bhuna jeera, salt, peper, and some secret spices which he would not disclose and gives us an excuse to visit padam chaat corner again and again to have this gol gappa’s. Then the mixture is stuffed in the fried crisp puri’s and then dipped in tangy tamarind chutney (saunth) and finished with yoghurt makes these gol gappa’s irresistible. This small joint works in a hygienic environment and must visit place for all chaat lovers. From past 100 years, this little joint is serving variety of delicacies. This place claims to invent a chaat. Surprisingly its neither deep fried nor oily. It is rather refreshing and healthy, as it’s all fruit. Don’t confuse this with any normal fruit chaat, Kulliya Chaat is no ordinary chaat. Asking about the idea of kulliya chaat, the owner said, One day I was experimenting by hollowing out the potato and filling it with spices and lemon juice, it tasted nice and I started selling it along with our other items. The word Kulliya is suppose to have been named after the “Kullhad”. Kuliya or Kulle is fruit and vegetable cups that are scooped out of its flesh and then filled with flavored stuffing. 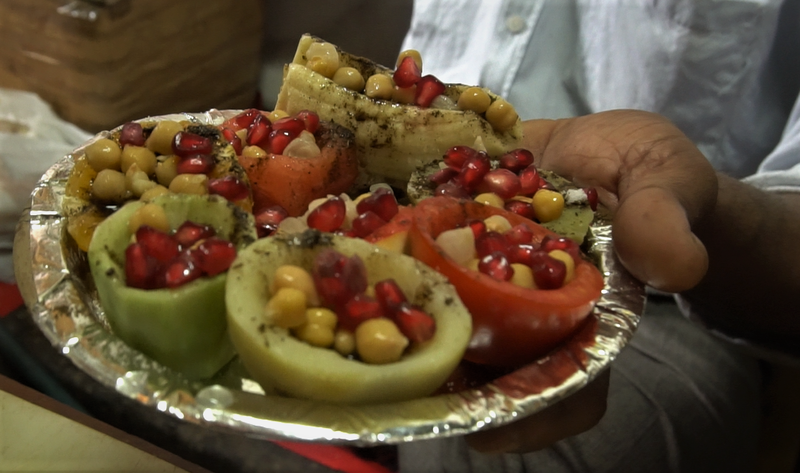 The Kulliya Chaat is a quintessential street food sold in Old Delhi. This wonderful edition of Fruit Chaat is great in taste and has an impeccable flavor. The fruits induces freshness, while tangy Chaat Masala gives it a marvelous flavor. Not to forget, the lemon juice balances the overall sweetness and makes it more delicious. They add boiled Chickepeas and fresh Pomegranate seeds. The crunchiness of Pomegranate contrasts with the softness of fruit cups and gives it a zesty tang. As more and more customers appreciated this Kulliya Chaat, they experimented it further and added a whole new range of fruits and other ingredients to make the Chaat more flavorful. Today, boiled potato can be substituted with sweet-potato, watermelon, apple, orange, banana or cucumber. The Chaat can be customized further and can be made extra spicy, tangy or a bit sour. They serve various items which include pav bhaji, aloo chaat which is yet another popular item in their menu. Cube shaped potatos are fried twice for the crunchy texture and wonderful taste. Also they serve, burger but there’s a catch the tikki’s are made with sabudana which increases the health element as well as the taste. So when are you going to chawri bazar, for the lip smacking and healthy kulliya chaat? Once upon a time, my friend, Ayush, and I met for a get together. Being great foodies, the discussion soon swung to the direction of food. Starting from Fateh ki Kachori in Civil Lines (that Ayush is quite fond of), we discussed food items with enthusiasm. Then slowly we moved to the quintessential breakfast dishes- poori and bhatura, whereupon he mentioned a poori shop in Shakti Nagar, that makes kofte, but only on Sundays. As the clouds gathered in the sky last Sunday, I gave him a call and in a few minutes, we were inside the shop savouring the pooris. The name of the shop is Rewari Wale ki Poori Sabzi. Located in Shakti Nagar, it is quite accessible- if you are coming from Roop Nagar, take the first right turn towards Gurudwara Nanak Sahib. After taking the right turn, take the first left turn; keep walking straight and the shop Rewari Lal will be on the left side. The complete address is 24/27, Shakti Nagar, Delhi- 07 ( Mobile- 9999935023). A big cauldron of oil where Halwais are frying the pooris can be spotted easily. The pooris at Rewari Wale, were simply made of maida. The sabzi was mix of chole, aloo and methi ki chutney. A spoon of dahi is added over it to mellow down the spices, giving it a tangy taste. Gopal Sweets in Kamla Nagar also do the same. What sets it apart from other poori sabzi walas of delhi are the aloo besan ke kofte. The small balls similar to the size of badi are made only on Sundays. Being a bit spicy, it served as the perfect combination with the poori. The shop was started 50 years back, by Sees Ram Saini, and is presently managed by father-son, Dharam Singh Saini and Vikram Saini. The shop is open till 3 pm and a plate of poori sabzi is priced at Rs 40. Very close to poori sabzi shop, the Sainis own another shop, which is famous for its khoya burfi and gajar pak. Ayush also introduced me to another popular breakfast joint- Jindal Refreshment Corner, on roshanara road. The shop is right opposite Kunji Lal Jagdish Prasad shop, and is famous for pure milk and lassi. The address is 8438, Roshanara Road, Delhi-07 (Mobile. 9953901089). Jindal refreshment corner is owned by Brajesh Jindal, Kunji Lal’s brother. Established 40 years ago, they specialize in bedmi poori and kachoris. Unfortunately, by the time we reached Kunji Lal, the lassis were over. The small size bedmi poori is priced at Rs 20 a plate. I found the sabzi to be better than what we get in other places. The sabzi is, again, a mix of aloo, chole, methi ki chutney, kachalu, and kofta, which keeps changing everyday- palak, urad dal, mooli. The distinctive strong taste of heeng in the sabzi makes it simply delicious. In the evening, they make samosas. Remembering the old days, Ayush recited the story of how he used to eat Jindal’s samosas on his way back home from school days, not in plates but straight from his hands. Long live his love for kachoris and samosas! TIMINGS- 5:00 p.m. – 1:00 a.m.
Tracing its origins to the 1950’s in the kitchens of the famous Moti Mahal restaurant of New Delhi, the Butter chicken has charmed the taste buds of food lovers all over the world. Many creative adaptations of the original recipe have emerged with varying combinations of spices and cooking styles being put to work in accordance with the tastes and preferences of the diners. Aslam chicken corner lays its claim on a unique interpretation of the butter chicken which has stunned the chicken lovers of the Walled City for the past 18 years. In the midst of the chaos that is characteristic of the Old Delhi area, the street lying right across the main gates of the Jama Masjid houses the four-storeyed building of the Aslam chicken corner. The entrance is deceptively small and is made tempting by the alluring display of chicken and fish being cooked slowly on a large chulha. The place does not have a large number of options for the visitor- just chicken and fish dishes with soda and cold drinks. However, the limited options owe mainly to the owner’s knowledge of what ‘Aslam’ does best. The butter chicken offered by Aslam’s Chicken Corner is a unique combination of the tandoori chicken and the original butter chicken. The chicken pieces are first marinated in a special combination of spices which remains a well-kept secret of the owners and chefs of Aslam. One would receive nothing more than a proud grin in reply to an enquiry about the specific spices that go into making the lip-smacking dish. The crowning glory of the dish however is the butter gravy which is prepared by mixing a curd-like ingredient with butter. A separate chulha is used to heat large blocks of Amul butter which is then combined with the curd and poured generously over the scrumptious chicken pieces. The melted butter seeps into the chicken thereby softening it and the curd lends a tangy taste to the dish which perfectly complements the buttery effect of the gravy. The chicken is served in a steel container with a basket of rumali roti- a unique type of thin bread which is known for its softness. The sight of the chicken floating in a pool of butter is a torturous one for the health conscious gym-maniac. However, one is sorely tempted to give in to the overpowering instincts of the uninhibited food lover that lies buried within layers of control enforced by an increasingly weight-conscious society. The extra hours of workout is totally worth the pleasure of biting into the succulent chicken dripping with pure hot butter followed by greedy gulps of cola to wash down the heavy gravy. Having succeeded in reserving a special niche in the hearts of chicken-lovers, despite the heavy competition meted out by older and more renowned chains like the Moti Mahal, Aslam’s chicken corner is most definitely an eatery which any non-vegetarian foodie must visit in order to get that one precious taste of this unique interpretation of a well-loved dish. During the visit, do try to take a look at the massive chulhas that are placed on the terrace with hundreds of chicken pieces lying ready to be cooked. If you have a penchant for cooking or are likely to fall into a trance at the sight of marinating chicken, you might as well get enchanted by the view in the open terrace whereby skilled chefs expertly handle the barbecue rods, sending magical drifts of a spicy scent into the busy breezes of Old Delhi. The chatter of the merry passersby and the hypnotic sound of the namaz being read out in the beautiful mosque often combine with this alluring smell to produce a charming atmosphere that dreams are made of. The scorching summer heat of the Indian Capital is renowned for its capacity to exhaust the most tenacious of tourists. Places like the Cool Point near Jama Masjid provide a most welcome relief from the energy-sapping climate. Sticking close to the obvious implication of its name, Cool Point is an eatery which boasts of a wide variety of sugary sweets, desserts and refreshing drinks which are sure to rejuvenate the exhausted tourist or citizen. Established twenty five years ago by Muhammad Zahid, the place is currently managed by his son, Zohaib. It opens at noon and closes just before midnight, offering a world of sweet delight to all those with a perennial or occasional sweet tooth. Cool Point is mainly famous for its Shahi Tukda and Phirni. Shahi Tukda is a traditional Indian dessert which traces its legacy to the Nawabs of Lucknow. It is made of bread which is deep-fried in pure ghee and then dipped in thick cream and sugary syrup. Layered with khoya, dry fruits and cherries, the dessert is sinfully delicious. The texture is a perfect combination of creamy and softly crunchy. The huge pan that one encounters right at the entrance of Cool Point, keeps warming the shahi tukda on a constantly low flame, luring in a large number of people with this bewitching display. Phirni is another beloved dessert which is made of milk and crushed rice. Served in clay containers, phirni has a milder flavor as compared to shahi tukda, but is nonetheless mouth-watering. The condensed milk dissolves quickly in the mouth while the soft sweet grains of crushed rice linger on the tongue, ensuring that the flavour of the dish is sufficiently absorbed by the taste buds. Apart from these items, Cool Point is also known for its kesar milk, badam milk, lassi and mango and vanilla ice cream. All the items are prepared daily with fresh ingredients by the chefs of Cool Point. 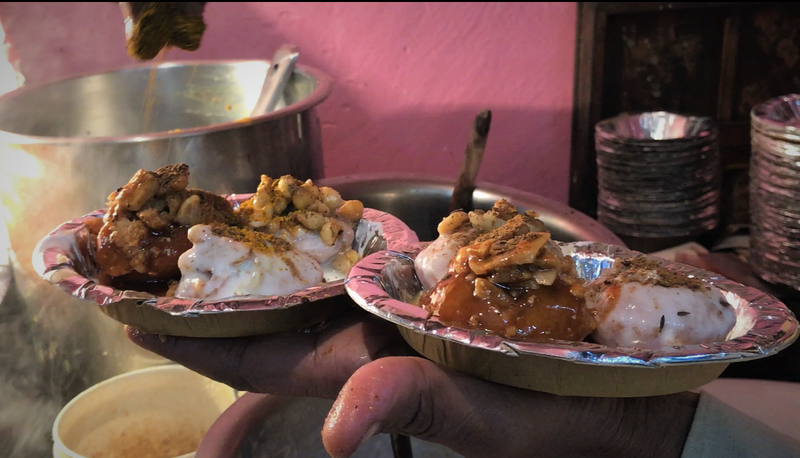 The desserts and drinks offered by this treasure trove of a place give sweet relief to the tourists after they feast on the heavy and spicy cuisine that Old Delhi is famous for. Despite the crude line of political tension that divides the nations of India and Pakistan, it is impossible to negate the centuries-old shared culture that constitutes the throbbing centre of the societies that thrive in both the nations. The chhole-kulche that is served in traditional North-Indian and Pakistani style allows the youth to get a taste of the times when the subcontinent was united. The chhole are cooked in a special mix of spices which are prepared by the chefs in their own kitchens by grinding the raw materials into fine powder. The smell of garlic and onions, while they are sautéed in huge frying pans in liberal quantities, is sure to tease the passerby’s nostrils and invite one to get just a taste of this North-Indian specialty. The chhole are served with slices of carrot and tamarind chutney which has a sweet and sour flavour. The gravy is cooked without any oil, rendering it healthy while being delicious at the same time. It has a subtle taste tinged with the smell of bay leaves, cloves, black pepper, cumin seeds and cinnamon. Unlike the popular renditions of this dish, the chhole are not very spicy and the gravy is delightfully light and flavoursome. The kulche that are served with the chhole are light, fluffy white breads made of flour dough with baking powder. They are baked in large quantities in traditional ovens which are unwieldy in their sizes. A food-lover can well imagine the delight of tearing into the soft pieces of the kulcha and dipping it into the scrumptious gravy of the tender chhole. Along with chhole-kulche, other popular Lahori-Amritsari dishes include Chhole-palak-chawal, Palak-paneer-chawal and dahi-bhalla. The chawal is not just plain rice. It is an aromatic dish whereby the rice is drenched in pure ghee and then flavoured with bay leaves, cloves, pepper, cinnamon and dry fruits. It is tossed with vegetables like peas and carrots and also with fried cubes of cottage cheese. This pulao is then served with varying combinations of gravy and side-dishes to suit the preferences of the diners. The dahi bhalla is soft and has a perfect blend of tangy and sweet flavours. That the partition of the nation could never bring about a divide in the lifestyle preferences of those living on either side of the border, is exemplified marvelously by the Lahori-Amritsari dishes that are lovingly prepared in food joints established by Pakistani immigrants in Old Delhi. Gole Hatti, which was established in 1954 by Shri Nathuram Kamboj, is once such food joint. They pack their dishes in clay containers for home delivery as they believe that the plastic containers are unable to preserve the authentic taste and smell of the food. The shop sticks close to tradition, to the point that the managers continue to use the ancient model of the telephone with the ring-dialer. The menu is small and the chefs prepare the food in an open kitchen. The shop earns its name from the circular shape of its structure due to its location at the turn of the main road. It is currently managed by J.P. Kamboj and Karthik Kamboj. Timings- 11:00 a.m.- 8:00 p.m. It has been my observation that Pehalwans are generally obsessed with food. And due to this inclination, they turn out to be real food entrepreneurs. Majority of them have opened restaurants and food joints across Delhi. I remember, Pehalwan Lassi Wala in Vijay Nagar, who offers their patrons a big glass of lassi with a thick layer of cream on the top, at just Rs 25. I used to rush to him after examinations at Delhi University. The Lassi was the only respite from the hangover of reading political philosophers day and night. In addition to its cooling effects, it also causes drowsiness and made me sleep for hours after that. At Churiwalan, in Old Delhi, Pehalwan’s Changezi Chicken is a well known name. The most famous Butter Chicken Shop in Matia Mahal, Aslam Chicken Corner is owned by Aslam Pehalwan. 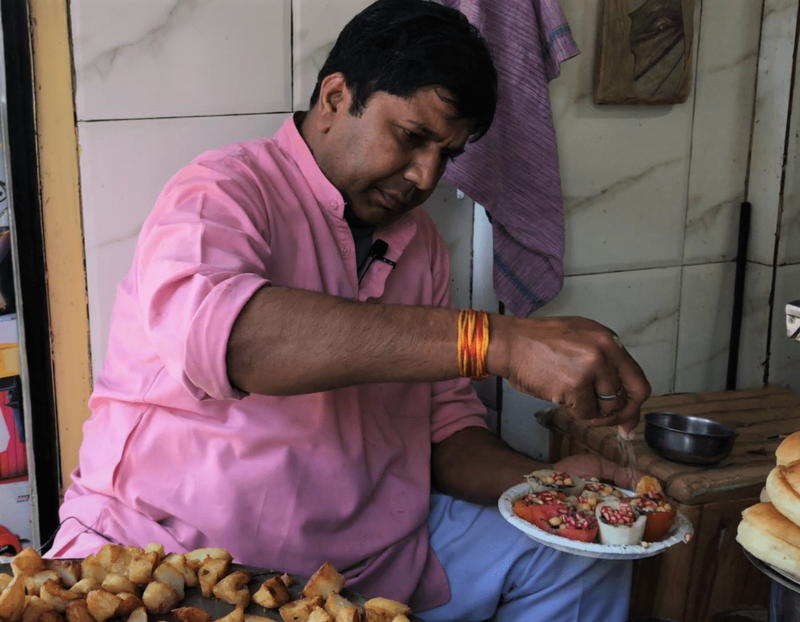 Another shop owned by a pehalwan in Old Delhi – Ghaseeta Pehalwan sells amazing pakodas. Recently, rains became an excuse for me to visit the pakoda shop to savour some Kalmi Vada Pakoda. Making one’s way through Paranthewali gali, one can arrive at the junction called Tiraha of Gali Paranthewali, Nai Sadak and Kinari Bazar. There, at the corner of Gali Heeranand is a small shop which tends to attract everyone with the delectable aroma of freshly made pakodas. The shop is famously known as Rajesh Pakodewala where the portrait of Ghaseeta Pehalwan in his traditional attire hangs on its wall. He is the third generation owner of the shop. His grandfather, 70 years ago, was the purana ghaseeta pehalwan. Interestingly, he started a new venture along with his wrestling profession, which was the pakode ki dukaan. I tried moong ki dal ke pakode and kalmi vada. Although the chaat of Kalmi Vada can be found at many chaat joints in Old Delhi, the kalmi vada pakoda is quite rare to find. All the doubts are laid to rest right from the first bite. It is prepared using urad dal, ginger, green chillies, black pepper and other important spices. Kalmi vade ke pakode are made from chana dal. You also get amazing mix pakodas, stuffed with aloo or gobi, at Rs 20 per plate. The pakodas are served in a dona with dhaniya and amchur chutney and aloo ki sabzi, with a heady aroma of heeng. Heeng is widely used as a substitute for Onion in Old Delhi. So, the ingredients at Ghaseeta Pehalwan’s shop include no onion, no garlic. The pakodas were crisp and fried to perfection. The batter of chickpea flour with spices was a perfect concoction that can be relished at the Pehalwan’s shop.